A Christmas Gift from TechnologyIQ! 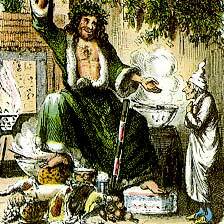 Sunday marked our 5th Annual LIVE Reading of Charles Dicken's A Christmas Carol. We had some new voices this year and had a great time as usual. You can listen to the entire show using the link below. Consider having your own reading of A Christmas Carol, or other favorite story, as a way to gather friends together and share a unique experience. You don't have to broadcast it like we do, but why not share it with the world! This year's show was sponsored by WelchWrite.com, Eclipse-1 Media and New Media Interchange. The audio CD of Patrick Stewart's one man version of A Christmas Carol is absolutely amazing. We saw the show several times here in LA and met Patrick one evening. His version of "A Christmas Carol" was the driving factor in starting our own yearly reading of the story.